In addition to announcing new launches in California and Florida on Tuesday, Colorado-based peer-to-peer car sales app Blinker also introduced a new partnership with Ally to offer vehicle protection products. This expansion follows Blinker's recent move into Texas in March. The company first joined the peer-to-peer car sales space two years ago in its home state of Colorado where it has been named a Colorado Company to Watch in recognition of its influence as a growing company in the state. The growing company provides users with an end-to-end solution for buying, selling or financing cars via an e-commerce platform that leverages artificial intelligence and machine learning. The mobile app is also fitted with consumer tools such as instant vehicle valuation, real-time auto loan approval and e-signing documents. “Blinker is on a mission to change the way people manage their vehicle ownership – putting them in control of the entire process right from their smartphones,” company founder and chief executive officer Rod Buscher said in a news release. “By expanding our financing and refinancing services, as well as our strategic partnership with Ally to the largest car markets in the nation, Blinker is proud to empower more drivers than ever. Blinker gives people the power to do in minutes what traditionally took hours, saving people precious time, money and stress typically associated with the vehicle ownership process,” he explained. With the new Ally partnership, Blinker customers can now add Ally's vehicle protection coverage, which includes both Ally guaranteed asset protection and Ally Premier Protection vehicle service contracts, according to Blinker. Ally vehicle service contracts coverage includes the repair cost for over 7,400 mechanical, electrical, safety or digital components, trip interruption, rental car coverage, towing and 24/7 roadside assistance, according to Blinker. Since launching in 2016, Blinker has secured 13 patents and brought in more than $44 million in vehicle sales, according to the company. Recently, the company was named a winner of a South by Southwest Interactive Innovation Award and 2018 LendIt Fintech Industry Award finalist. The company says it is the first to allow people to buy, sell, finance or refinance their vehicle with the snap of a photo. 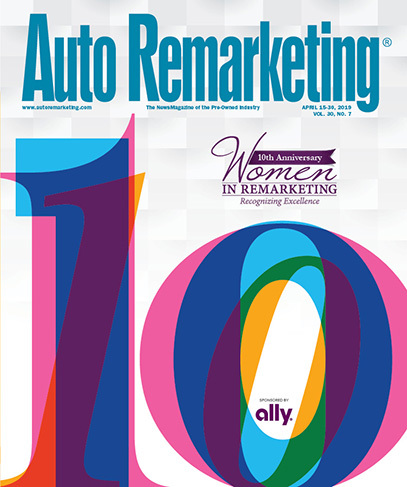 Auto Remarketing recently recorded a podcast with the Buscher, the founder of Blinker, which can be found below.